A Mexican Fiesta party is so colourful and fun, it allows you to explode with a bright vibrant colour palate. 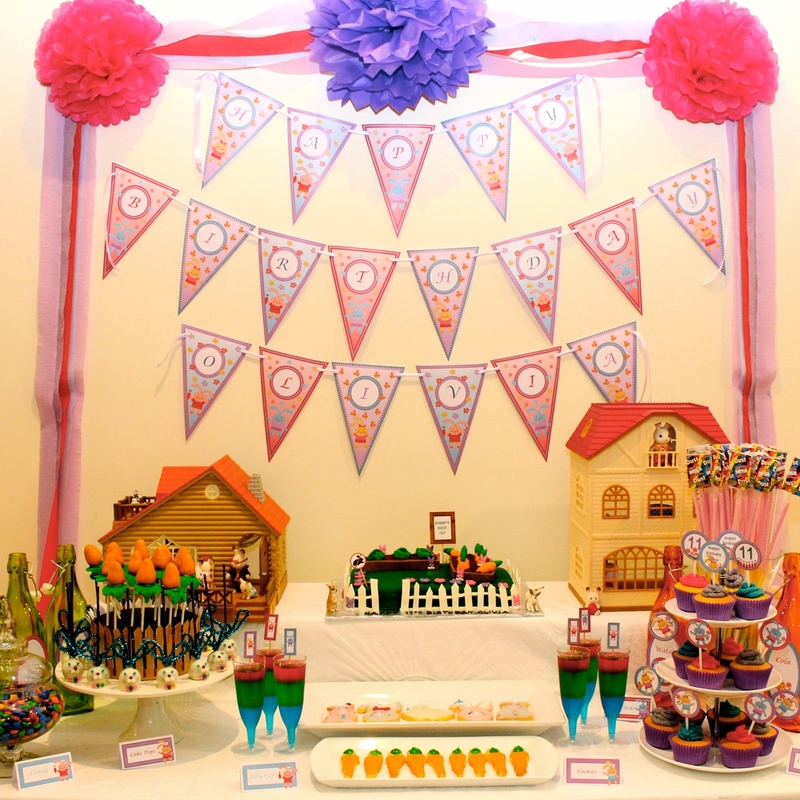 For this party we have a Mexican dessert table, Mexican Decorating ideas, Mexican Fiesta birthday Cake, Mexican favours, Mexican games and a set of free printables so you can create this party at home. We made three types of decorated sugar cookies for this party including guitars, maracas and Chili peppers, the cookie cutters were all found in on-line cake decorating stores. The stars of the dessert table were a pair of Mexican Bull Pinatas. They graced either side of a Mexican Fiesta Birthday cake. I always try and include fruit in my dessert tables and find fruit skewers allow you to be creative while serving a healthy treat, that said it is a dessert table so we included a set of harlequin margarita glasses from pottery barn filled with assorted bright coloured candy. We found a cute Chili table cloth for the dessert table and decorated beverage bottles with Mexican hats and printed labels available as a free download. The ceiling was covered with helium balloons and fiesta bunting, we used colourful pink and blue glasses, maracas and Mexican party decorations. The birthday cake depicted a Mexican fiesta with hanging flags, a pinata, cactus and balloons, while I have broken some rules by including non-edible components the cake was easy to assemble and enjoyed by the children. This party included two party favours. We included a living succulent favour in a really decorative pot with a thank you card and a small jar of layered candy treats with a Mexican hat topper. We painted “Fiesta” in bright colours on the candy jars, the thank you notes are available as a free download. We had a number of games and activities at this party including a photo booth, scavenger hunt, Guess the Jars, Pinata, pass the parcel, Mexican hat Dancing and more. The photo booth was a real hit and it was so easy to create. We used a lot of crepe streamers and attached them to the wall to create a bright stripped backdrop, we then attached a colourful boarder. A Pinata, filled with treats provided a real challenge. We created scavenger hunt for this party that is available as a free download. Each child had to find 8 unique Mexican themed cards as part of the hunt, these cards we carefully placed both inside and outside and provided lots of fun for the children. A prize was offered for the first one to find the cards. This was a great party and a really good choice of theme that allows you to be creative using simple bursts of colour from streamers and balloons. In the summer months we always find it hard to extract the children from the pool, so a pool party is always an enjoyable option. For this party we created a carved shark watermelon, beach ball cake pops, mini pavlova swimming pools and a pool styled birthday cake. For a different type of favour bag, we created small pools from plastic storage containers, filled them with goodies and topped them with a swimmer and umbrellas. A range of printable items were created and are free to download. A great day overall, a pool party is a must over summer. Mini Pavlova Pools and beach ball cake pops graced the dessert table. Mini Pavlovas have to be one of the easiest items to make, we used store bought pavlova shells then filled them with whipped cream with a touch of blue food colouring. We decorated cake pops with simple edible glitter and topped with a silver ball. The cake pops were placed in a styrofoam holder covered with blue celephane and a printable boarder. Fresh fruit is always great for a party and we loved this carved shark with a mouth full of fresh fruit skewers and an old barbie doll with some red syrup on the legs for good measure. The eyes were also simple with olives and tooth picks. Cup cakes are a must have and are always devoured, we includes some life savers in the spirit of a pool party and some blue jelly cups. Our birthday cake was also pool inspired and was simple to make with a garden of crushed chocolate ripple biscuits and coloured gel for the pool. These were topped with some pool sun lounges made from royal icing, palm trees, umbrellas and flowers. As this party was mostly outdoors we tried to refrain on the indoors, just a nice water image table cloth and lots of balloons. I like to get creative with party favour's and this one was quite simple but very effective. We purchased small blue plastic containers that were filled with goodies and covered with blue cellephane. We added a thank you card, a swimmer and a couple of umbrellas, The thank you cards and swimmers are available as a free down load. Most of our games revolved around novelty pool races including races while sitting in rings or on kick boards. We did have a number of team relays and you can download our team selection cards here. These were laminated and used to create teams . We included one treasure hunt using water proof items and making it slightly harder by naming some of the pieces. This year we created a Hansel and Gretel Halloween theme. This party consumed a large part of the house with a full dessert table, working Witch's kitchen and a darker adult take on Hansel and Gretel. For this post we focus on the dessert table where we used elements of Hansel and Gretel first finding the Candy House through to the nastier side of the Witch. We created a set of printable products to accompany the dessert table, these are available from our shop. This theme was a lot of fun we hope you enjoy. Our dessert table used a simple crushed velvet table cloth. On the wall we added a large spooky cardboard cut out tree with a witch peeking around the side. Some large spiders were then added to the wall. The cupcakes represented the Witch's candy house. We used a small violet crumble's for the house and licorise all sorts for the roof and door. The house was decorated with tiny trees and candy canes from a christmas sprinkle range. For cookies we used a witch boot and shoe, we decorated these quite simply with gold and silver couscous balls. Colourful candy is a must for this theme, we used small crystal bowls and lots of shapes and colour. Toffee apples are also great for a halloween Witch theme, we used black chopstick and decorated using mini bunting from our printable range. The cup cakes did take some time to assemble but used simple techniques. I must give my husband credit for jack O'lantern carving, he found a wonderful spooky witch stencil which worked a treat. Please see our shop for full details of our Hansel and Gretel Printable products. This year was my daughters 9th Birthday so we decided it was time for a tropical theme and settled on a Hawaiian Luau Party. Hawaiian Luau parties are a lot of fun, you can go slightly crazy with the theme because most items are very easy to source and not very expensive. The key elements of this party include a Dessert table, Palm Tree favour bags, Games including a scavenger Hunt, lots of decorating ideas and a custom range of printable products. Our Desert table was the focus of the party, a dessert table must be both appealing to the eye and totally delicious. Iced Cookies are a great way to brighten this table, for this party I used Dolphins, Flamingos and Palm trees. I do all the decorating myself so I keep the icing simple but they still brighten up the table and we never have any left over. I just love these Pina Colada Cake Pops, they were easy to make and look great dressed with a hibiscus skirt and topped with a cocktail umbrella. The cake pops sat in a stryfoam circle mould which I covered in a paper Tiki wrap and used shells and flowers to disguise the foam base. We used fruit shaped candy and topped the candy jar with a small grass skirt. Cup cakes are a must for a dessert table we used a simple butter icing and 2 inch circles from our printable range. Fresh Fruit Skewers were placed in a watermelon basket carved to look like Waves, this looks very effective and the fruit is a great counter balance to the sugar. We used simple cup cakes with a butter icing. The cup cakes were topped with printable circles from our Hawaiian Luau printable range. You can find lots of good Pina Colada tutorials on line, these were very effective on the dessert table. This was a fun cake to make, the elements are all simple. I used plastic trees from my local cake decorating shop which is also where I found the edible flowers. The ocean is edible jel also from my local cake decorating shop, the towels were made from strips of coloured icing and I used liquorice for shark fins. The luau Party sing is paper and a part of our printable range.. The Dessert Table was created using a number of easy to find elements. We used cardboard Tiki Poles to frame our table and used a wonderful window image as a central focus. We then added a long table skirt to the dessert table and a shorter table skirt was used to frame the window. Fresh Singapore orchids were used on the table as was our printable range of products. We used helium balloons in bright colours and hung tiki lights to brighten the ceiling. This is a great way to add a lot of colour in a simple way. We used plastic images to add a lot of colour and fun - the children loved the bathroom image. We decorated the tables with some colourful Tiki's and tropical birds. Paper Pineapples, Singapore Orchids and grass skirts are all easy ways to brighten you rhome and add to the theme. Why use store bought plastic bags when you can create a personalised favour bag in the party theme. These were simple to make, but did take quite a few hours to complete the set. We added party Thank You Cards from our printable range. A tutorial will shortly be posted on our blog. The object of Limbo is to pass under the bar leaning backwards without knocking the bar from the poles. If you knock the bar from its position you are out. Continue to lower the bar until you have a winner. A scavenger hunt is always a hit at my parties, I've created a set of printable cards and a printable wallet. The Cards are hidden throughout the house and garden and the children race to find all the pieces. Don't make this too easy as the children love a challenge. Traditional Hawaiian Dancing is a lot of fun, make sure you have enough grass shirts, Lays and hair clips and a good sound track. Many elements in this theme easily move to a pool or beach party, this theme is also great for an Adult parties. Store all your props in plastic containers for future use. Recently we created a Bunny Birthday Party for one of my daughters. 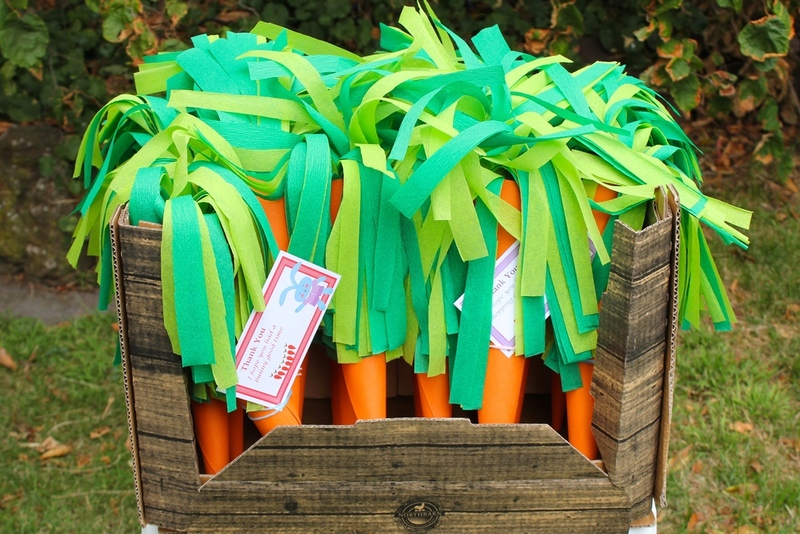 One of our favourite items from this party were these cute carrot favour bags, which we filled with lots of treats. They are not difficult to make and the children really loved them. 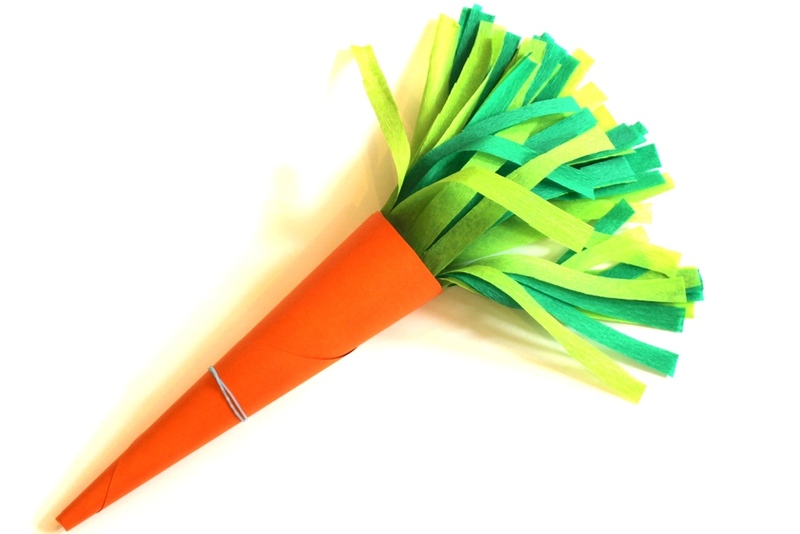 While we made fairly large Carrot Favour Bags, you can easily vary the size and create exactly what you want. Today we are posting a simple 5 stage tutorial, I hope you give them a try at your next Bunny Birthday Party. To see this party in action visit our Bunny Birthday Party. Roll the orange card into the desired shape and glue the underside. 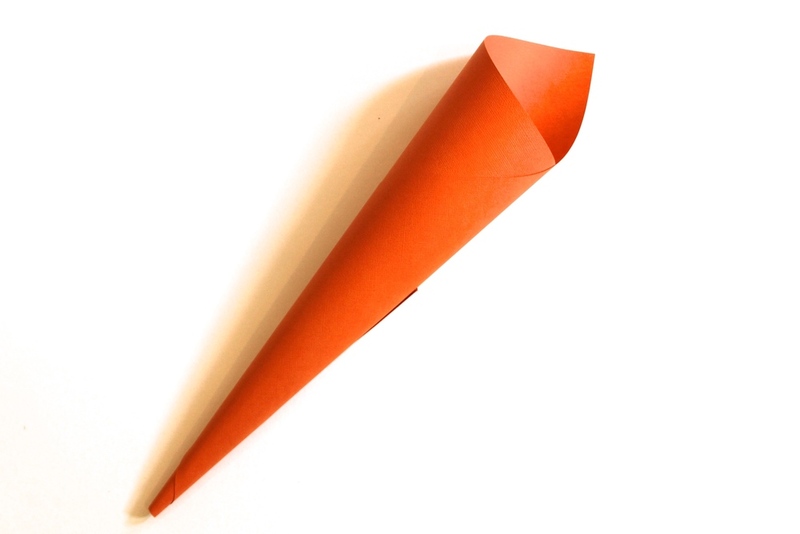 I then placed a rubber band around the carrot to stop them from un-rolling while the glue dried. I then cut around the top opening to form a even circle. Lay the light green Crepe paper over the Dark green Crepe Paper. Determine how long you want your carrot leaves. Double that and cut along the whole length of the crepe paper. Then cut that into smaller sections, as per your carrot size e.g. double the circumfrance measure. Fold the crepe paper in half and then fold the fold the bottom edge up once for strength. Cut slits from the other end as per the picture. Finally we folded the leaves in half and taped then to the inside of the Carrot Favour Bags, which we then filled with treats. We displayed our Carrot Favours in a box we found in the recycle cardboard bin at Cosco, and added thank you cards from our Bunny Party Printable Range. My middle daughter has a total love of all small animals, so it was only time before we had to have a Bunny birthday party. We had a lot of fun creating the dessert table for this party. 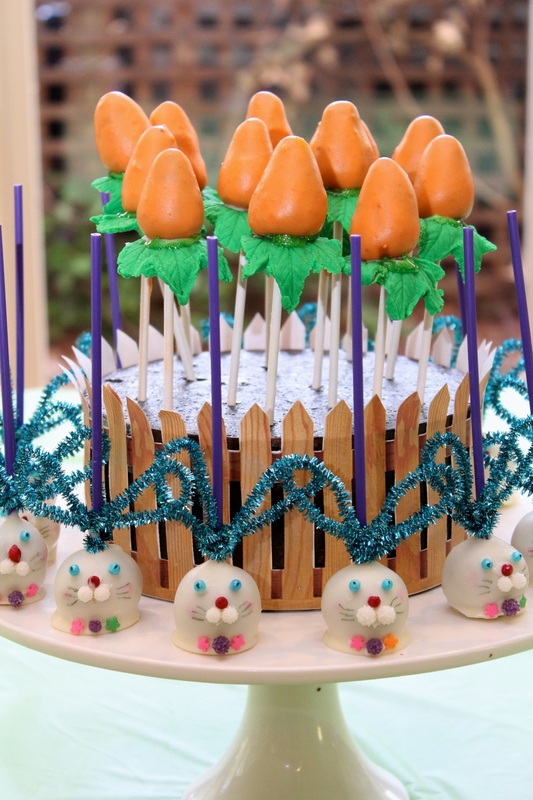 We used both carrot and bunny cake pops and carrot and bunny cookies. To this we added cup cakes and layered jelly. 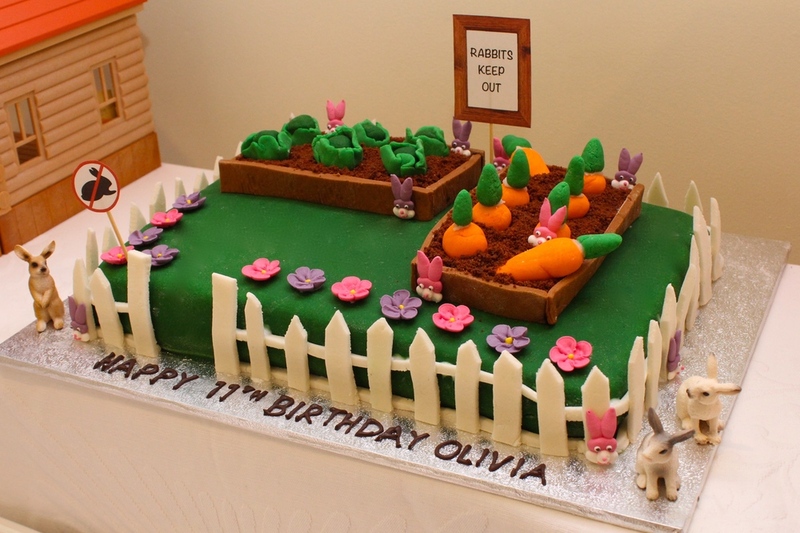 Our Birthday Cake is a delightful cottage Vegetable Garden, with naughty bunnies trying to eat the vegetables. We created a printable range featuring bunnies in blues, mauves and red, this range will soon be available in our shop. To style the bunny dessert table we used a collection of country cottages and bunnies from the Sylvanian Family range, these really complemented the theme of the party. For a different type of favour bag, we created paper carrots, that we filled with treats, these carrots were very effective and we will soon post a tutorial. For activities we had real bunny feeding, a bunny scavenger hunt and a bunny photo booth. A great day overall and a great bunny birthday theme, enjoy. The ideas for the bunny cake pops came from Bakerella and while they did take some time they were a big hit with the kids. For the carrots I made cone shaped cake pops and created sugar paste leaves, using a silicon leaf press. The carrots are displayed in a styrofoam circle (available from cake supply shops) with a cute picket fence to keep the bunnies away . Dessert tables are the place to let your creativity run wild. Our Bunny Dessert Table held lot's of bunny edible treats and the rabbit range of Sylvanian families. Our Printable collection includes the cake toppers and Jelly toppers. The Sylvanian Families range provided a great feature on the dessert table. The bunny cake pops looked really effective, but do take time to create. They can be made the day before but leave a good couple of hours aside for creating the detail in the faces. You have to have cup cakes at a party, we've created these cute bunny cake toppers, just perfect for bunny parties. We used a three types of cookie cutters for our cookie bunnies, and found a delightful carrot cookie cutter to create some carrots. I had a lot of fun making this cake, I'm not a cake decorator so I have to select designs that are fairy straight forward and do not require too many techniques and the Vegetable garden was just perfect.. While this party did have a lot of sweets, we included a simple vegetable and dip platter which we called bunny food. These cute Carrot Party Favours turned out really well, they were simple to make but look really effective and like a real carrot. We filled the carrots with goodies and included a Thank You card from our Bunny printable range. I actually found our carrot crate in the cardboard recycle box crate at Cosco. It looked great and did not require any work. At this party we had real bunny feeding, a great bunny scavenger hun and a photo booth. The bunny feeding station was a hit with the children, I used a commercial bunny food and small cup cakes wrappers. I'm sure the bunnies had as much fun as the children, they were the centre of attention for a few hours and had lots of pat's and hugs. The Scavenger Hunt game includes a sign, envelopes for the cards and nine treasure hunt cards to be placed around your house and garden. Using Blu tac, hide the cards around your garden. Remember to make it a challenge, but not too hard. I tend to hide all the same type of card in the same area, this way the children can swap clues to find the cards. I created a simple photo booth where the children could select a real bunny or a plush bunny and a set of bunny ears. Out of interest they all choose the really bunnies.